An accentuated transition from domed glass to bezel, featuring a redesigned crown that provides a lower profile casing. New bracelet design with a custom designed fold-over clasp, and a genuine wood dial and molded indices. ORIGINAL GRAIN is the premier maker of natural wood and steel watches. We are purveyors of style forged of wood, steel and a fresh approach to classic traditions. We hold our timepieces to the highest standards of craftsmanship, authenticity and quality. In doing so, each of our products is truly an original. The Classic Collection features the silhouette that started it all, setting the bar for a timeless element of style with a mix of exotic hardwood and steel. SUSTAINABLY SOURCED – All of our wood comes from reliable sources and is certified by the Forest Stewardship Council. 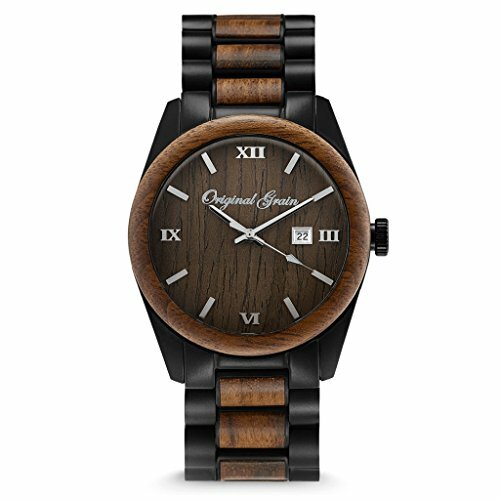 This wrist watch features natural ebony wood from Indonesia. Our premium wood watches can be worn daily and won’t degrade or become brittle over time.